Thank you so much for your financial and prayer support for this important work of translation. Because of you Bible translation is moving forward in Mexico and more and more groups are getting God’s Word in their language. 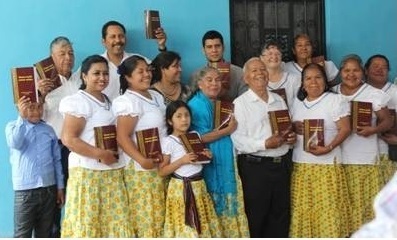 In just the first few months of this year New Testaments have been dedicated in three Mexican languages: Mazatec, Mayo, and Mixtec; and we’re expecting even more to be dedicated this year. The job that takes most of my time is supervising the work of 67 translation teams. So you, through me, have had a part in these translations, and what God is going to do through them! Pray for the Mayo people, Ixcatlan Mazatec people, and the Magdalena Peñasco people that God may use his Word in their lives. Below is a picture of some of the team that translated the Mayo NT. The linguist is Nancy Hagberg, 2nd from the right on the back row. 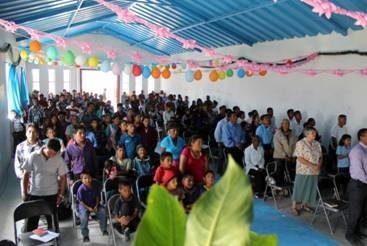 Genesis in Amatlan Zapotec was also dedicated this year! Close to two hundred Zapotecs gathered for the celebration of this first Old Testament book in their language. I continue to review the Zapotec Old Testament translation and advise the Zapotec team doing it. Currently Exodus-Judges and Psalms-Ecclesiastes have been drafted. A certain number of those have been reviewed, revised, community checked, and have been approved by a translation consultant. Pray for protection for the Zapotec team (Chucho, Tonio, Samuel, Joel, and Elica). They’ve had many attacks of the enemy.The pictures are of Chucho holding a copy of Genesis and the crowd gathered in the Baptist church. Sylvia and Gedeon continue to work on the dictionary. Soon they hope to be finished revising the Zapotec side of it. There will still be a lot of work to complete it. Please pray for Gedeon and God’s leading in his life. Pray for a good Skype connection and wisdom to know how to express each word. Faith Presbyterian Church continues to support Mr. Dave Riggs and his wife Sylvia with their Ministry in Bible Translations. Mr. Riggs presently supervises and manages teams of people in their Bible translation work in the 68 languages of Mexico. The Riggs’ often encounter many complex issues with the language translations. “Sylvia continues to work on the dictionary with Gedeon. The other day they came across something unknown to us before. As you may remember, words in Zapotec have different meanings depending on the tone. Wena if said on rising then a high tone means a simple “okay”; but if wena is said on a low then a falling tone it means “okay” but as an agreement to a request. I’m sharing this with you so you have some idea of the complications they get into. Besides my administrative job, I’m continuing to help the Zapotec translation team with all sorts of questions and problems as well as reviewing their translation drafts. Currently, I’m looking over the last chapters of Deuteronomy. 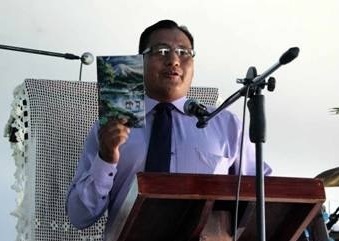 All this is possible because of your faithfulness in giving to God for this great work of Bible translation. We greatly appreciate you and thank God for you. Dave and Sylvia also enjoy seeing God at work. “One Aztec translator told of how he started working in translation many years ago just because it was a job and he needed the money. But as he worked on God’s Word in his language, God reached out to him and he became a Christian. Since then, he has completed the translation of the New Testament into a neighboring Aztec language and now he is working in yet another Aztec language and will complete the translation in 2014! Each one of these translators has their story of what God is doing in their lives.